Have you heard of Goody Gorilla? This is another popular monthly subscription service which sends out a box full of new snacks in sample sizes (usually 7-10 healthy snacks, many which are gluten-free or vegan) for your to try with your family. I love boxes like these as you get to try different snacks to see which ones you like and which you don't, so you don't end up buying a full-size bag, only to find you don't care for it. In addition to sampling new snack foods, these monthly boxes also make for great gift ideas to send to family and friends. I remember back in college seeing friends who lived away from family receiving care packages of their favorite snacks. This was before monthly subscription services became such a hit. Now, parents can simply go online and order a box like Goody Gorilla, to surprise their child with away at school. Or, how about sending a Goody Gorilla box to new parents, as a get well care package or for someone in a care facility, as well as a welcome gift, congratulating someone on a job well done or new promotion. Whoever receives a Goody Gorilla box will be thrilled when they open it up and find it filled with tasty snacks. 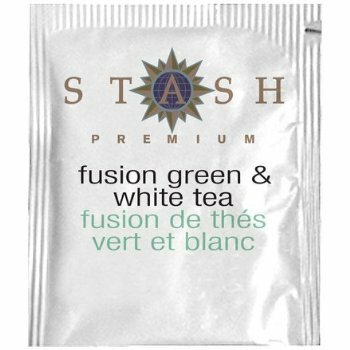 Stash Premium Fusion Green and White Tea -- Luckily, two tea bags were included in the box, so that my husband and I could try out this tea. Never having heard of Stash Tea before, we couldn't wait to brew up a cup after the girls went to bed and see how it compared to other green and white teas. 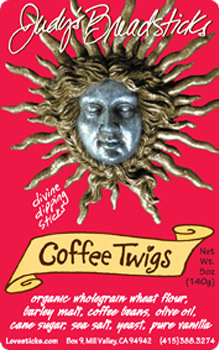 This tea is made with 100% natural ingredients, including blended green and white teas. After just a few minutes of brewing, we were able to enjoy a fresh tasting cup of coffee. I love how the two teas were combined, as I usually just drink green tea, for its antioxidants. I will definitely be picking up more Stash Premium teas to enjoy with friends and family. To learn more about Stash Tea, visit their website at: http://www.stashtea.com/. St. Claire's Organic sour lemon tarts are a naturally sweet candy, which contain acerola berry and vitamin C. It is also allergen free as it contains no wheat, gluten, dairy, casein, corn, soy, egg, fish, shellfish, nuts or tree trees, making it a great candy to have on hand when you have a scratchy throat, looking for a breath freshener or just want to pucker up. I ended up sampling these lemon tarts as my husband and kids are not big lemon fans. And, I have to say that I am glad I was able to, as I really liked these candies. They were not to sweet and packed enough citrus lemon to wake your taste buds up. This is another product that we will be buying more of. :-) To learn more about St. Claire's Organics and their products including the sour lemon tarts I sampled, visit their website at http://www.stclaires.com/. 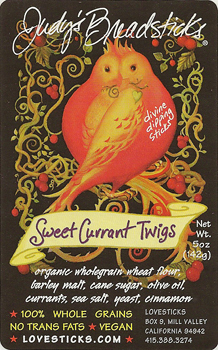 Out of all the samples included in this month's Goody Gorilla box, Judy's Breadsticks Sweet Currant Twigs was the only large sample that offered enough for the whole family to enjoy. The bag included 5 breadsticks. While the girls weren't big fans of these breadsticks (or any breadstick for that matter), my husband and I found ourselves looking for things to dip these tasty breadsticks into. I ended up grabbing a jar of Nutella, while my husband paired it with almond butter. Even though we were dipping these breadsticks, they are full of flavor that you could just eat them right out of the bag. 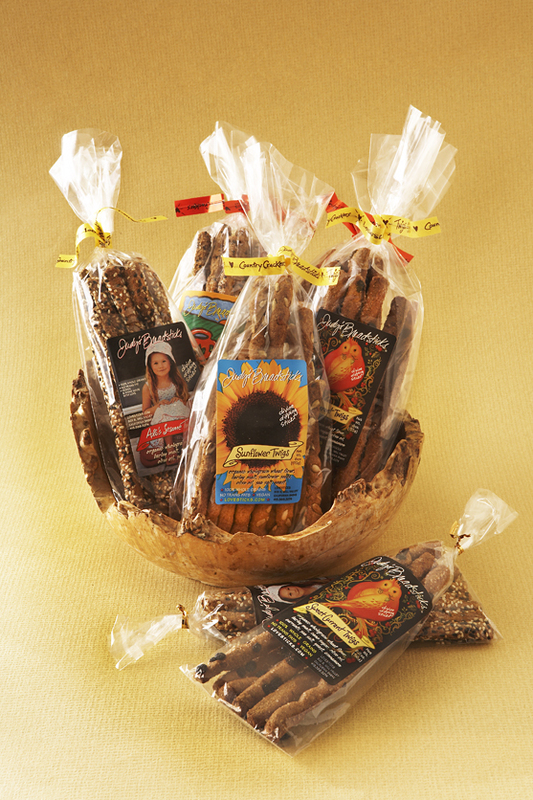 "Our 4 Cheese MultiGrain snack crackers are made from a blend of parmesan, cheddar, blue, and asiago cheeses. Their full flavor and crispy texture make them a tasty snack munched right out of the bag. Enjoy the entire pack for only 70 calories." Savannah is a fan of crackers in our house, and was first to grab these multi-grain Get Movin' crackers from Partners to try. Little didn't she know that they were 4-cheese flavor. Come on, what kid doesn't like cheese snacks or food? :-) When she took her first bite, she was so excited that she could taste the different cheeses, as they reached for another and another, before the bag was empty. This is one snack I will be happy to pick up for the girls to enjoy at home or on-the-go, while also stealing a few for myself. :-) To learn more about these tasty gluten-free crackers visit the Partners Crackers site at http://www.partnerscrackers.com/OurBrandsProducts/GetMovinSnackPackCrackers/. While we have tried Welch's fruit snacks in the past, the mixed fruit variety was new to us. I was happy to see the girls share this sample bag. They loved pointing out the different fruit snack shapes before popping them in their mouth to enjoy. As a mom looking for healthy snacks for on the go, Welch's has always provided me with peace of mind, when I pick up boxes of their fruit snack for the girls to enjoy. To learn more about Welch's Fruit Snacks visit their website at http://welchsfruitsnacks.com/. Another thing I like about Goody Gorilla is that they offer you the opportunity to buy items you receive in the box at discounted prices. So, after trying out the new snacks, you find yourself craving a particular cookie or chip for instance, why not buy more, while also saving at the same time? A good deal, right? Goody Gorilla helps you fill your cupboards and pantry with healthy snack options for your family, without paying retail or the need to clip a coupon and hope they take it at the register. 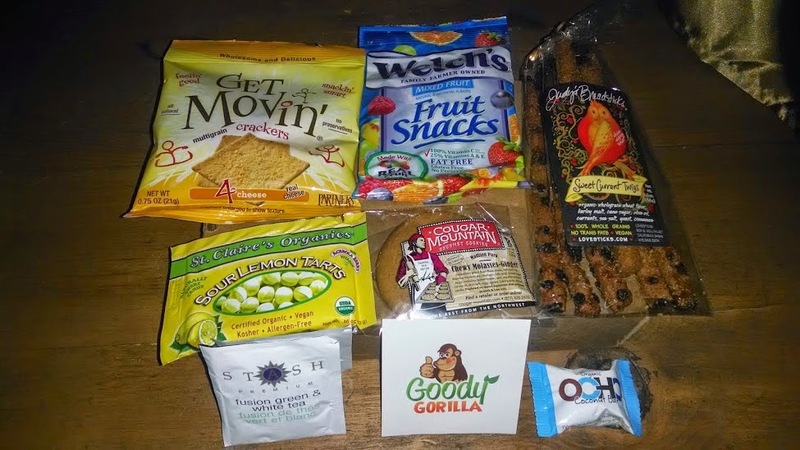 While some may think $15 is a little steep for a monthly snack box of samples, I have to say that compared with others I have tried over the years, Goody Gorilla ranks up their with my favorite. They offer a wonderful selection of products that the whole family will enjoy sampling, and you will find yourself wanting to buy more -- which is the main reason you sign up for these types of monthly subscription services -- to sample and find new snack options. Well, out of the seven samples I was sent to review, I can see myself picking up most in a full-size package again soon, especially the Get Movin' 4-cheese multi-grain crackers, which were a hit with the girls. If it wasn't for the Goody Gorilla box and their samples, the girls would not have found another snack they enjoy. :-) And, my husband and I found some new favorites, too! To learn more about Goody Gorilla, or to start your subscription (1, 3 or 6 months) or send a box as a gift, head over to their website today -- http://goodygorilla.com/. I can't wait to hear what you think of this monthly snack subscription box. Want to give the popular Goody Gorilla a try? Then, head over to their website and start your subscription today. 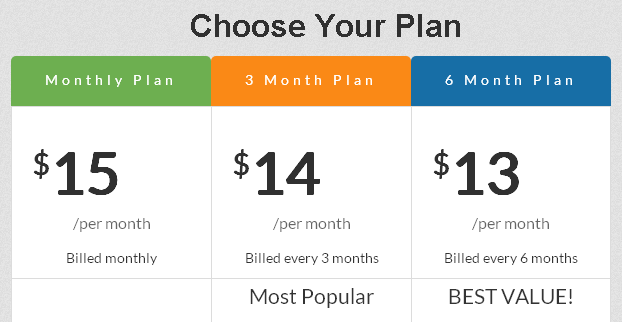 You can sign up for 1 monthly box for only $15 (includes shipping). And, just for Inspired by Savannah readers, don't forget to use coupon code GOODY3 at checkout, to receive $3.00 off your first order. Act fast, as the discount code is only valid through July 31, 2014. Thanks to the kind folks at Goody Gorilla, one lucky reader will win a Goody Gorilla box (a $15 value), to try out for themselves. To enter this fun giveaway, just complete the entries on the Rafflecopter form below. Good luck!